Valentine’s Day Candy for Sweethearts of All Ages! Valentine’s Day is often thought of as a holiday for 2 distinct groups of people: kids and couples. For kids, it usually means creating Valentines to share with classmates and friends, or choosing their favorite pre-made Valentines at the store, which are usually available in a wide variety of styles ranging from timeless to trendy. For couples, Valentine’s Day is typically accompanied by candy, flowers, and an evening out at a special restaurant. For as nice as these things are, they aren’t something everyone can enjoy. Firstly, most of the people reading this are not kids. Secondly, not everyone reading this is part of a couple, and even those that are may have other people in their lives they’d like to extend a little Valentine’s Day love to! We aren’t suggesting anything scandalous – Blair Candy isn’t looking to be a home wrecker! We just wanted to give you some candy suggestions that are perfect for co-workers, friends and family members; sweet treats that are sure to bring a smile like only candy can. Cool Candy for Kids: Looking for something unique for your children, nieces, or nephews? Kids are usually huge fans of novelty candy. If it’s something they’ve never seen before, they want it twice as badly! If it lights up, sprays, or squeezes, add a few bonus points. Some super fun Valentine’s candy picks for kids include Giant Gummy Bears, Icee Squeeze Candy and Skittles Sour Light Up Spray. 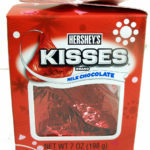 Want to give them novelty candy that brings a Valentine’s theme? A box of Puppy Love Candy is perfect for Valentine’s Day and has enough sweets for 18 of their favorite friends! Retro Candy for Adults: Want to give something special to friends and coworkers who have a few more candles on their birthday cake each year than they care to admit to? Our nostalgic candy makes for a tempting treat that’s packed with memories. 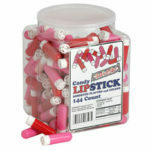 If you want to keep with the popular pink and red theme of Valentine’s candy, consider sharing Candy Lipstick, Atomic Fireballs, or even some cherry or strawberry Air Heads Taffy. Just because the package isn’t covered in hearts and cupids doesn’t mean the candy inside is any less delicious or perfect for Valentine’s Day! Candy Criminal Has a Sweet Tooth He’d Steal For! While most of us were snoozing away yesterday a 21-year-old man in Mesa, AZ was busy allegedly breaking into a Blockbuster Video store. It wasn’t a romantic comedy he was after, or even a new release, but the sweet stuff by the counter we all know and love – candy! While Blockbuster’s candy offerings don’t quite rival those of Blair, we have to admit they do bring an impressive offering to the movie-viewing public. And while we never condone theft of any kind, except perhaps Goober stealing our hearts, if you’re going to get caught red-handed, you might as well get caught with red gummy dollars or Hot Tamales! Does the winter weather simply come with candy cravings in the air? Are we destined for dreams full of cotton candy clouds with mountains made of Mounds Bars? Are we dooming each other to criminal records or long walks through the snow simply by saying “Sweet Dreams”?! Perhaps. Perhaps we are. But we can fight back. We can protect ourselves against frosty fingertips and embarrassing mug shots by making sure to stock our cupboard shelves with our favorite treats. We’ve personally never needed an excuse to keep candy in the house at all times, but if you’d feel better having one, we hope this helps! Eat Your Heart Out! Jelly Belly Just Got a Little Bit…Gross? Among the many sweet teeth at Blair Candy, there is no shortage of Jelly Belly fans. Few can resist these truly unique treats that take one of the most basic and loved candies in the world, the jelly bean, and turn it into something exciting, unexpected, and every bit as sweet as its original inspiration. But not content to rest on his fabulously-flavored laurels, David Klein, the brain behind Jelly Belly jelly beans, has created a candy lineup that is at once a work of art, and…well…kind of gross. 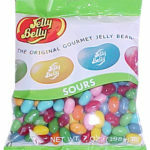 We read about the new gummy candy from the Jelly Belly giant on the always-interesting Time NewsFeed. With an article title like, “Gummy Genius: Jelly Belly Inventor Creates Realistic Candy Heart, Blood, Urine”, I think it would be tricky for anyone to walk away without a quick read, let alone someone in the candy business! I quickly learned that the candy blood is actually inside the anatomically correct candy heart, and when the heart is bitten in 11 distinct locations, the candy carnage unleashes a sticky-sweet bloodbath. As my mind struggled with deciding between ‘Ewww!’ and ‘Awesome!’, a new word was born. I think David Klein’s candy heart is nothing short of Ewwwsome! The candy heart is the star of the article, but there are mentions of other creations that sound both tasty and nasty as well. Which of David Klein’s creative candy masterpieces would you be most tempted to try? 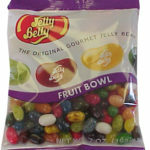 Or are Jelly Belly jelly beans as close as you want to get to this gummy great’s goodies? Do You Like Your Technology With a Side of Chocolate and Peanut Butter? You Better Get to CES! We all know by now that in the world of electronics, smaller almost always equals newer, faster, and in general, better. However, were you to ask me this morning if I thought smaller being better applied to candy as well, I’m not sure I would be as certain! But that was this morning, and this is now. 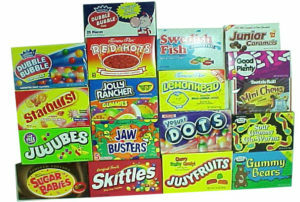 Now, after I’ve read this exciting article – Salivate: State-of-the-Art Candy Makes CES Debuts – on BrightSideOfNews.com. The taste buds of the Blair Candy Crew are no strangers to the allure of Reese’s Peanut Butter Cups in their many delectable incarnations, and we couldn’t be more excited that they have been crowned the official candy of the Consumer Electronics Show! It takes us back to a time almost 30 years ago, though it seems impossible that it’s been that long, when another Reese’s candy was making waves not of a technological sort, rather the extra-terrestrial variety – Reese’s Pieces. A little blockbuster by the name of E.T. the Extra-Terrestrial, starring an adorable alien we all instantly loved, helped moved Reese’s Pieces from a forgotten corner of a candy shelf to the front and center of every shelf and every sweet tooths’ cravings.